Sandra graduated from Texas A & M University with a degree in Animal Science and an MBA from St. Edwards University. She is one of the first to become a Certified Canine Rehabilitation Practitioner from the University of Tennessee. She is recognised nationally and internationally in the area of canine exercise therapy and conditioning. Sandra is committed to continuing education and has extensive training in rehabilitation methods and modalities, including electrical stimulation, therapeutic ultrasound, and aquatic therapy. 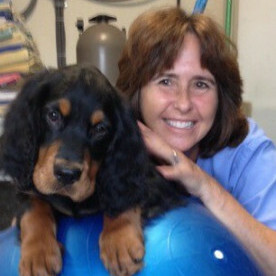 Sandra is owner and rehabilitation practitioner of Canine Rehabilitation and Conditioning Center of Texas. She competes with her Gordon and English Setters in Confirmation, Agility, Obedience, Lure coursing, and Rally.